If you want H2O or Chemical Continuous Fill Boiler model without stopping for tank to cool down, order Desiderio PLUS +$200Or See Continuous Fill 311° Heated Boiler Unit on Desiderio PLUS under Other Items below to compare. Virtually unmatched and unchallenged, the Vapor Clean Desiderio Dry Steam Vapor Cleaner is limited only by your imagination. Equipped with a perfect combination of 311 degrees vapor power with a commercial strength two stage vacuum and combined injection system, the Desiderio will allow you to virtually clean and sanitize every surface imaginable. The Desiderio steam / vapor and injection system gets out stains that conventional machines leave behind as well as eliminating the bacteria, molds and mites which cause annoying allergies. The Desiderio's water filtration system traps bacteria and dust in its collection tank and exits through an additional filter. Because of the advanced steam settings, even the most valuable furniture can be cleaned safely. 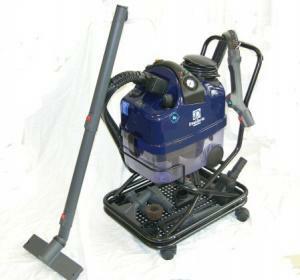 This machine can also be used as a regular vapor steam cleaner, doing windows, grout, ovens, etc. Steam and extraction buttons on the handle designed for stress-free operation. Filtration system The solids and liquids go into the water filter tank and then pass through another filter to ensure clean outlet air. 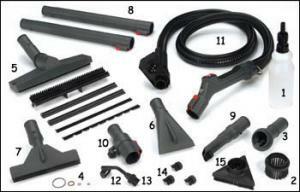 Air-turbo brush Part of the air generated by the motor is used to spin a specially designed bristle brush for carpet cleaning. The nebulizer It is used to spray detergent solution, with or without the steam, directly on the surface to be cleaned and suction the dirt at the same time. The lower the steam pressure, the higher the consistent temperature and the drier the steam. Pressure is great for down and dirty cleaning, but for everything else....turn it down. Condensation occurs at a higher pressure output....so once again, keep it down and let the heat do the cleaning. Remember, the sooner you cut out cleaners on your floors and surfaces, the sooner the residues will disappear. Soap residue attracts dirt and your floor or other surfaces actually get dirty quicker. There is no purer clean than steam. Never put anything in the boiler or reservoir other than tap or distilled water. On the other hand don't be afraid to use a safe cleaning agent if you run into a difficult situation that may call for more than steam. Cold water and soap cleans ok, but use that same soap with hot water and watch what happens. The same principal applies. Get to know your accessories and their purpose. Extension Wands - To be used with Floor brush, Triangle Brush or detail attachment. 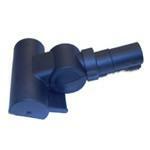 Elbow attachment - To be used with Floor brush and triangle brush to attach to hose nozzle or extension wands. This allows both of these attachments to have different positions for cleaning. Floor Brush - Nylon bristled large rectangle brush with clips to attach towels or mop pads to the brush. Large Triangle Brush - Nylon bristled large triangle brush with clips to attach towels for cleaning walls, upholstery, cabinets etc. Can I use this steamer to remove chewing gum? The machines will all work on gum. However, so not to use the vacuum function when cleaning gum. Use steam function only, loosen the gum and then pick up with a towel. This would avoid any complications with gum sticking inside the hose or one of the attachments. steam is coming out at all when I press the steam button. The vacuum suction part works but no steam at all. 3) hold the steam button (on the hose) and turn the steam regulator knob (on the machine) all the way to the right, then all the way to the left while holding the steam button. This should reset the hose. Customer service was great. I called for help with selecting a product. The person I talked to took her time in finding out which product would best suit my needs and promptly returned my call. This is the second Vapor Clean product I have purchased over the past few years. 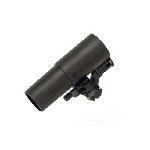 Your web site was very easy to navigate, the product description was excellent and the delivery time was outstanding. One request: would you be able to make available additional accessories/attachments for this item? I know it may be difficult to do this with a manufacturer in Europe, but it would be helpful to know that additional/replacement attachments and accessories would be available, especially with such an expensive unit. Thank you.